The Centers for Medicare and Medicaid Services (CMS) recently released results from year 1 of Medicare’s largest pay-for-performance program, the Merit-based Incentive Payment System (MIPS). Although most MIPS eligible clinicians avoided financial penalties in the first year, recent work by LDI Fellows suggests that CMS could enhance MIPS payment policy to ensure more equitable payment and greater accountability for costs going forward. MIPS weights clinician performance across four domains – quality, cost, improvement activities, and promoting interoperability – to generate a composite score. This score determines whether clinicians will receive positive, neutral, or negative adjustments to their Medicare Part B compensation. In a recent Health Affairs blog post, Joshua Liao, Amol Navathe, and colleagues found that small practices performed worse on composite scores than large practices. As shown below, small practices were much more likely to receive a negative or neutral payment adjustment than rural and national practices, and less likely to receive positive adjustments for exceptional performance. Liao and colleagues make several recommendations to better support small practices in MIPS, including implementing quality scoring adjustments that cater to small practices; simplifying reporting requirements and the number of measures reported; and adapting incentives from other models to help small practices meet resource goals, such as CPC+’s fixed, per-beneficiary-per-month payments to invest in care management. MIPS began in January 2017 under the Medicare Access and CHIP Reauthorization Act of 2015 (MACRA). 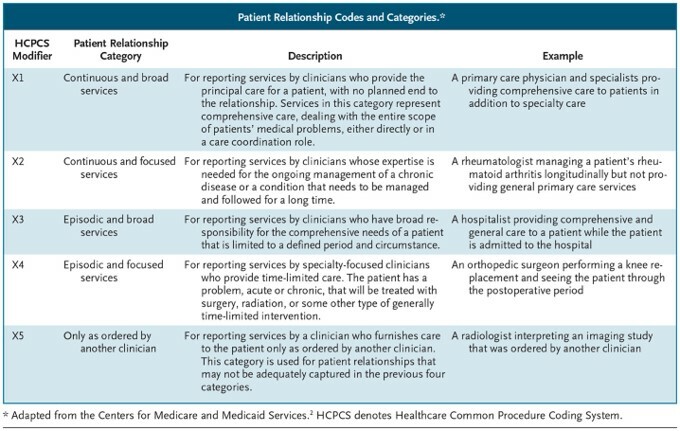 MACRA’s patient relationship codes – which categorize a clinician’s relationship to a patient at a given point in time – also warrant attention for their potential impact on clinician reimbursement under MIPS. In a NEJM Perspective, Samuel Takvorian, Justin Bekelman, and Matthew Press recommend that CMS consider several changes to the implementation of these billing code modifiers, which clinicians may submit voluntarily to help Medicare determine their responsibility for aspects of a patient’s care. In the future, these codes may be used to calculate resource and cost-related performance measures that ultimately will influence clinician payment. Although this type of measurement is important in assessing clinician performance under MIPS, Takvorian and colleagues warn of several unintended consequences, such as increasing administrative burden; oversimplifying complex clinician-patient relationships; and prompting the clinician to take or forgo responsibility based on case complexity. To guard against these consequences, Takvorian and colleagues recommend that the codes be validated and subjected to periodic auditing, and tested in conjunction with MIPS’s new care episode and patient-condition codes. The use of these codes by clinicians who care for patients with complex conditions or of low socioeconomic status also warrants extra scrutiny. Ultimately, MIPS is a significant part of Medicare’s larger shift from fee-for-service payment to value-based care. If this transition is to succeed, CMS must ensure that MIPS payment policy continues to foster clinician participation, particularly given physicians’ early concerns about MIPS. Keeping small practices engaged and supporting clinicians as they take on greater accountability for costs will be important components in Medicare’s value-based transformation.